- Provides relief from arthritis pain, muscle strain and sprain. - 100% Pure Ayurvedic preparation of flaxseed Oil, Camphora Oil and Mint Oil. 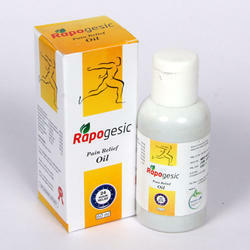 Pain Reliver Joint Pain Oil For Frozen Shoulder And Survical, 120 Ml. Dosage: Dosage	Gentle massage 2 to 3 times or as directed by the physician. Packaging Type: RUMAXEL Oil : - 50 ml Bottle with attractive outer carton pack. For external application Excellent combination of systemic and locally acting ingredients. A&J Amrutha Rathna Pain Oil give quick relief to joint pain, back pain, neck pain, muscular pain, rheumatic pain, and osteoporosis.